Win a 2 yr lease on a Lexus NX or other great prizes! Win A Lease on a 2018 Lexus and Help Neurofibromatosis! Here’s an event you can participate in from your couch and possibly win a two year lease on a 2018 Lexus NX! 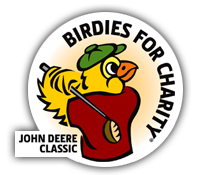 For John Deere’s Birdies for Charity all you need to do is make a pledge and guess at the number of birdies that will be made during the John Deere Classic which is going to be held July 9-15. A two-year lease on a 2018 Lexus NX will be awarded to one person who guesses the right amount. For instance, in 2017 the golfers shot a total of 1918 birdies; in 2016 it was 1982; and in 2015 it was 1990. The pledge can be a fixed amount like $40.00 or per birdie – such as .01 per birdie (which in 2014 would have been $20.40). John Deere underwrites the entire expense so 100% of your donation goes to the cause, PLUS a bonus of 5% to 10%. It’s super easy! Pledge online now and be invoiced later. Be sure to spread the word. Pledges must be made by July 6th! We’d like to see an NF Midwest supporter win!